January 9, 2019 (San Diego) – Congressman Duncan Hunter has sent a letter asking President Donald Trump to remove a Navy SEAL charged with war crimes in Iraq from the brig at Miramar Naval Air Station where he is being held pending trial. His arraignment is slated for Friday. January 1, 2019 (San Diego) – Temecula Mayor Matt Rahn has filed papers to run against Congressman Duncan Hunter, a fellow Republican, in 2020, the Valley News reports. A scientist and land use consultant with background in ecology and sustainability, Rahn has represented San Diego State University and the Pechanga tribe in their battle against the proposed Liberty Quarry, the Riverside Press Enterprise reported. Update June 6, 2018 9 a.m. -- According to the California Secretary of State, with 100% of precincts counted but not late mail-ins or provisionals, the results are: Duncan Hunter 48.7%, Ammar Campa-Najjar 16.3%, Bill Wells 13.1%, Josh Butner 12.1%, Patrick Malloy 6.0%, Shamus Sayed 2.1%, and Richard Kahle 1.1%. The finish order for candidates was the same in both San Diego and Riverside County, with only late mail-in and provisionals yet to be tallied. June 5, 2018 (San Diego's East County) -- Beleaguered Republican Congressman Duncan Hunter could be in trouble come the November election. Currently under criminal investigation for allegedly spending lavish amounts of campaign funds for personal use, he currently has less than half the vote in the primary race. With 15.3% of precincts tallied, Hunter has 47.62% of the vote. The big question is who will advance to the top-two run-off election in November. Presently, Democrats Ammar Campa-Najjar, a former Obama administration labor official, and retired Navy Seal Josh Butner are in second and third place with 15.45% and 13.79% respectively, followed closely by El Cajon Mayor Bill Wells at 13.42%. Democrat Patrick Malloy has a 6.36% and Shamus Sayed 2.04%. March 13, 2018 (San Diego) – President Donald Trump has blocked a takeover of Qualcomm by Singapore-based Broadcom, which would have been the biggest technology merger in history. Update March 9, 2018: Carl DeMaio announced that he won't be turning in papers by the filing deadline today to run against Rep. Duncan Hunter. In an e-mail to supporters, he wrote, “While I, too, am frustrated with the lack of results and the double-standards for Washington politicians, I believe the Gas Tax Repeal Initiative campaign and our plans for subsequent reform initiatives in California are so much more important,” Times of San Diego reports. March 8, 2018 (San Diego) – Former San Diego Councilman Carl DeMaio has pulled papers to run in the 50th Congressional District currently represented by fellow Republican Duncan D. Hunter. DeMaio served one term on the Council from 2008 to 2012. He has previously run for mayor and lost to Bob Filner. He also ran for Congress previously but was defeated by Scott Peters, who currently serves in the 52nd District. March 4, 2018 (San Diego’s East County) – Congressman Duncan D. Hunter (R-Alpine) has received endorsement of the California Republican party. 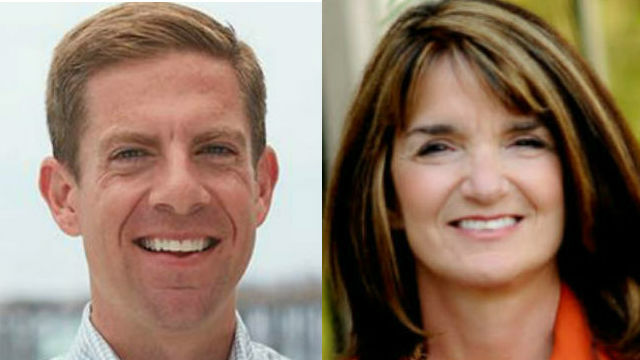 The GOP chose the incumbent Hunter over Republican challengers including El Cajon Mayor Bill Wells, Sheriff’s sergeant Andrew Zelt, and businessman Shamus Sayed. March 1, 2018 (Washington D.C.) -- Following up on efforts last week to have the Trump Administration initiate a review of the proposed takeover of San Diego-based Qualcomm by Broadcom, Ltd, Congressman Duncan Hunter (R-50) sent a letter to Defense Secretary Jim Mattis requesting his personal and direct involvement before a shareholder meeting occurs on March 6. Subsequently, Congressman Scott Peters (D-52) joined the call to halt the merger. January 13, 2018 (El Cajon) – On Thursday, one day after revelations that a Grand Jury has been convened and issued a subpoena in a federal criminal investigation into Congressman Duncan Hunter’s alleged use of campaign finances for personal use, the progressive group Indivisible called on Hunter to resign.